Girls Who Rock on TV! Many writers say that each book is like a new baby. I agree. Today I welcome my newest book baby into the world. Say hello to More Girls Who Rocked the World! Like any new parent, I'm blind to any ugliness and only see the book's beauty. I'm pretty proud of this one. It's a collection of 45 short biographies of girls and women who did something amazing, something to change the world, before hitting their 20s. These are stories of girls going after their dreams and achieving greatness. While researching, I learned some amazing things. African-American dancer Josephine Baker was also a high-level spy against the Nazis during WWII. After the war, her adopted homeland of France awarded her their top honor, the Legion d'Honneur. At age 5, Annie Oakley began hunting for game to feed her family and by age 15 she supported her entire clan with her sharpshooting earnings, even buying the family a house! Nellie Bly, one of the first female journalists, pretended to be crazy to get herself locked in a mental institution, after which she wrote a blistering exposé for the paper. Then she traveled around the world by train and steamship, with nothing but one dress and a few pairs of underwear. She did it in a world record-setting 72 days! Beverly Cleary, beloved writer of the Ramona and Beezus series (among others), won her first writing contest when she was a 4th grader. 12-year-old Beyoncé competed on Star Search, a national TV show like today's American Idol. Beyonce's singing group, called "Girl's Tyme," lost to a bunch of old white dudes! Clearly, she didn't let that setback stop her. 12-year-old Nadia Nadim escaped from Taliban-occupied Afghanistan, where it was illegal for girls to play soccer. She went on to become a soccer star on the Danish national team and the Portland Thorns. 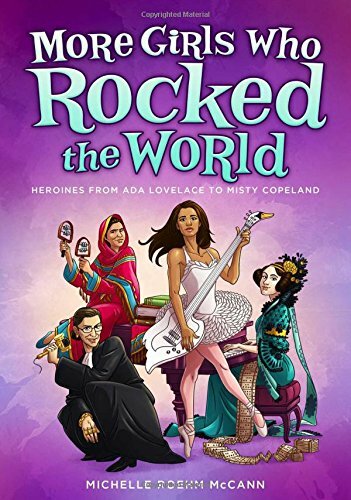 Starting October 3, More Girls Who Rocked the World will be available on Amazon and at your local bookstore. I hope you enjoy reading about these amazing girls as much as I enjoyed writing about them. Girls really do rock!